Many awaited the grand appearance of Papa Guédé, who in fact did arrive dressed to the nines. His appearance this November warm night was foreshadowed by a great gust of the north wind and a deathly cold chill in the air. Those who were outside the Perystle felt his approach as the drumming reached a fever pitch inside and many of the dancers slowed from the heat filling the room. That’s when Guédé appeared and wanted to hear another song, have another drink, and eat another meal! The party for the dead really began. With top hat, dark sunglasses with one eye out, to symbolize his power in the world of the seen and the unseen. And with a large thick dark cigar he found with his offerings and with a smile all knew he was very pleased. Sallie Ann Glassman is an initiated Vodou priestess who calls up and mediates the power of the Spirit. Sallie is internationally recognized for her lectures, art, readings and healing ceremonies. She is one of a handful of Americans ordained into Vodou in the traditional Haitian initiation. Sallie is passionate about sharing the rich spiritual and cultural heritage of Vodou. 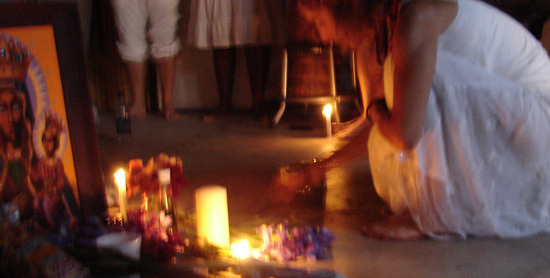 Often maligned and misunderstood, Vodou is actually a healing and life-affirming religion. This ancient religion, currently practiced by 50 million people, speaks directly to our troubled world today. 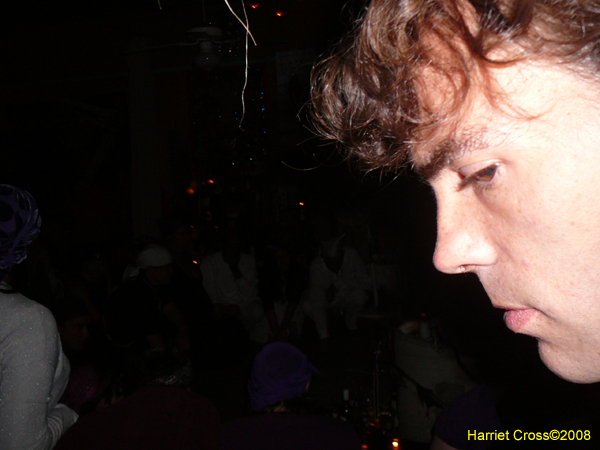 She believes that to discover Vodou is to embark on an encounter with divine mystery. Sallie owns the Island of Salvation Botanica, a store and gallery specializing in Vodou religious supply, medicinal herbs, and Haitian and local artwork. The shop was awarded the “Best of City” award by National Geographic Traveler in 2004. As artist and writer, Sallie has done much to further the understanding of Vodou. She is the author of the widely acclaimed book Vodou Visions, published by Random House. She is the co-creator and artist for The New Orleans Voodoo Tarot, and the illustrator of The Enochian Tarot. A captivating and powerful speaker, Sallie is frequently invited to lecture on Vodou at universities and conferences. In New Orleans, she performs annual public ceremonies for St. John’s Eve on Bayou St. John, the public Hurricane Prevention Ceremony, and for The Day of the Dead. Sallie has been featured in numerous publications such as The New York Times, The Los Angeles Times, The Wall Street Journal and The New Yorker. She has appeared on CNN, National Public Radio, CBS News, The Discovery Channel and The World News Tonight with Peter Jennings. Book your Hotel Room in New Orleans for 2008-2009 Day of the Dead Celebration.